The ability to assess the value and character of a wine is essential to a successful Sommelier. In this module, each successful participant will; develop your palate, your ability to discern quality and value and your ability to evaluate wines by: colour, weight, alcohol, taste, flavour, texture, complexity and finish. Learn to recognize poor quality, wine faults and spoilage; learn what causes the taint and explore possible corrective actions. 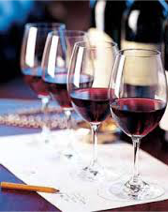 Learn to recognize wines by style and taste profile in order to judge varietal typicity. Finally, become familiar with various strategies for pairing wine and food and get exposure to wine service skills. This course is instructed by Mark DeWolf, Carman Mills and Simon Rafuse, and runs twice yearly, starting in September and January.